I found myself randomly looking through my phone and found the most cringeworthy “selfie” that I’ve taken–a photo of my edges gone. Here’s the backstory. My hair has changed a lot over the years. One of those changes are that my hair has become brittle and super dry. This is mainly because of my own inconsistency with taking care of my hair. I explained in this post, my love/hate relationship with my hair and I must admit the love has grown stronger. In February 2017, I went to an African hair braiding salon in Brooklyn to get box braids. 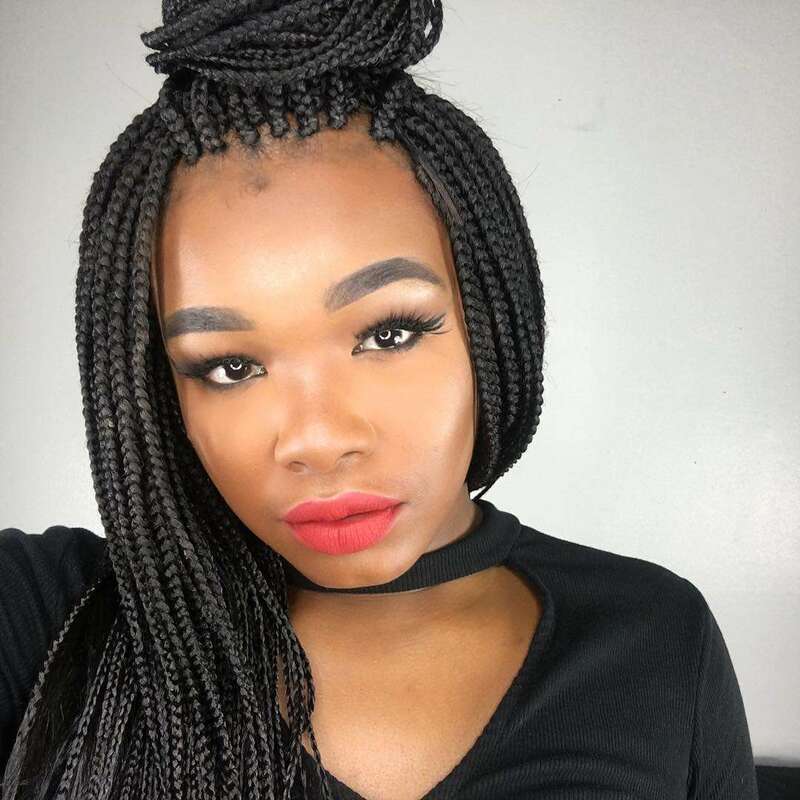 Growing up, I often put my hair in box braids because it was a great protective style for me. Braids are super low maintenance which helped me keep my hands out of my hair. However, this time around getting braids was the last thing I should have done with my already damaged hair. As you can see, the weight of the braids and the tightness literally pulled my hair our–mainly around the edges but also in the middle. If you ever have had your edges break off you know just how long of a process it is to have them grow back. My edges were completely bald to the point where all you could see is shiny skin. It took a lot of patience and consistency for me to get the growth that I have gotten a year later. For months after getting those box braids I still didn’t have edges or a sign that they would grow back. I actually thought that I was developing traction alopecia however with patience I got them back. Sidebar: I have thin hair and always have so I did not expect my edges to be super thick–however I’v made a ton of progress and I’m so proud! 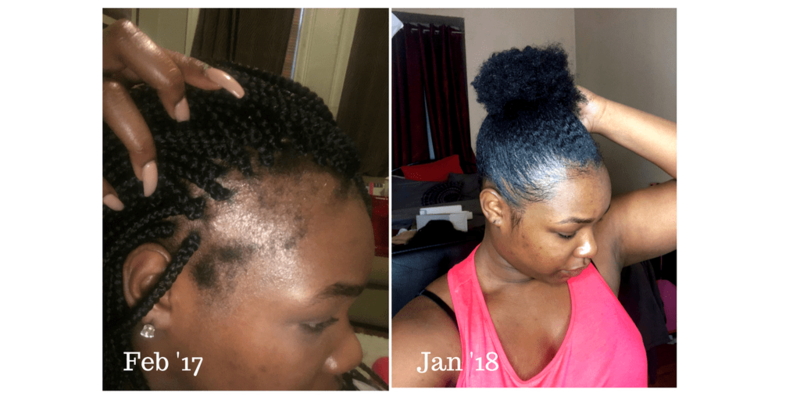 Here how to grow edges if you’re struggling much like I was. The bottomline is dry brittle hair is prone to breakage. It doesn’t matter if it’s in the middle of your head or around the crown. Keeping my edges moisturized was probably the MOST important thing that saved my edges. I moisturize my edges every morning and night because my hair soaks up moisturizer. However, I listen to my edges–if they don’t need the extra moisture I don’t provide it. My favorite “moisturizer” at the moment is Cantu Shea Butter Leave In Conditioning Treatment. Technically it is a leave in conditioner for damaged hair however it really keeps my normally dry hair SUPER moisturized. It also smells really good. My only complaint is that it can leave a whiteish film in your hair if you use too much but just use less product. For a long time I was not sold on the idea that massaging your scalp helps to stimulate growth however the proof is the pudding. Blood circulation helps to get the juices flowing and promotes hair growth. Here are a few things I use for scalp massaging on a daily basis (oils) and weekly basis (shampoo massager). Castor oil is hands down the best oil to thicken hair and making it manageable (from experience). It also promotes hair growth. This is one of those products that you see all over YouTube and other social media that people rave about how fast it made their hair grow and it is true. After using this oil blend I could see my hair filling in at the outter most post to fall my hair line. It takes consistency but it works wonders. Click the photo for a list of ingredients. Shampooing Scalp Massager (stops you from scratching and feels great). It also helps to alleviate your scalp of unnecessary product buildup. Product build up clogs your hair follicles which WILL stop growth. When you’re using your moisturizers and oils to tend to your edges you need to also make sure you are cleansing your edges to get rid of build up. I either splash my edges with some water while in the shower or wipe my edges with Witch Hazel after using it as toner for my face. Regular wig caps dry your hair and edges out BADLY. If you already have damaged edges you need to keep your distance from them. Wearing a silk or satin bonnet under a wig on the other hand will not dry out your edges or cause unnecessary tension to your hair. Of course, you should be wearing this to sleep as well. While my hair hates braids, it LOVES wigs. Sidebar: I do 2 strand twists under my wigs NOT braids. Paired with a bonnet, wigs have pretty much saved my hair–the low maintenance of a wig has done wonders for my edges as well. I prefer affordable wigs because I love saving my coins and switching up when I can. Overall, I’m extremely proud of the results I’ve gotten during this journey. This is definitely not the end. If you’re interested in keeping up with my edges and hair growth journey make sure you subscribe to my blog so you won’t miss anything.